Who generates the leads — marketing or sales? 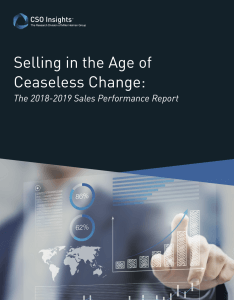 The study includes a year-over-year comparison of sales performance along with an overview of what companies are doing in each of these four areas to drive success. “Even though the objectives of sales leaders haven’t changed – most continue to be focused on making their number while being effective with resources – it’s a mistake to assume their sales organizations have a permanent set of customers or a permanent suite of sales technology and resources. According to this year’s report, more companies are meeting revenue commitments, with the average revenue attainment rising to 93.9 percent to make this the third straight year of growth. However, the leading indicators of conversion rates – win rates and quota attainment – haven’t changed. Rather, 15 of 16 seller abilities included in the report show lower performance than they did five years ago. The overarching message is that sales transformation isn’t a project that will eventually reach completion — It’s a ceaseless evolution that feeds off data and uses technology as a driver, not an enabler. And, above all, it ensures every action an organization takes is in full alignment with the customer’s journey.